One of the most appreciated sheep breeds because of the fiber’s premium quality, Merino is used by the clothing industry – especially in making clothes and other accessories for babies. The quality carcass and its skin are only two of the reasons which position the breed in the top of the most valuable breeds – considered as „rareʺ by weavers from many countries. This type of breed is well-known for its finest fiber and is appreciated by designers and weavers and has weights between 260 to 350 pounds. This sheep breed produces good milk and delicious meat. This is the main reason which the Dorset sheep is highly demanded on the market worldwide. Also known as Queen of the Mountains, Turcana is one of the most appreciated breeds from Romania, Ukraine, Moldavia, Greece, Albania, Croatia, Poland and Balkan countries. Turkana’s wool is used in the production of oriental carpets, it is appreciated for its meat and, of course, for their dairy products – the milk is used to produce feta, yoghurt and various cheeses. Besides, they are quite resistant to diseases. The Dorper sheep don’t need special conditions to be raised – it can be bred in dry areas. Its body can range from medium to large size. In western regions, this type of breed is highly popular for its ability to easily accommodate to seasonal changes. Its wool is put to good use in producing clothes. This kind of sheep is raised for wool production as well as for the products such as milk and meat. The Romanian shepherds try to improve the genetic performance in order to obtain the best quality. The shepherds made crossbred in order to obtain the best qualities from multiple types of breeds. One of these crossing breeds is the Hampshire sheep which has a varying skin tone. This type of sheep is medium-sized and is hornless. 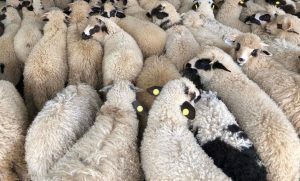 This type of sheep provides best qualities – the Suffolk sheep – rams and ewes shows stamina and the mutton carcasses are appreciated for their high quality. Another category of breeding sheep is East Friesian, known for the amount of the milk which can produce – This type of breed produces around 990 to 1100 per 220 to 240 a day.